As you may know we have been invited to attend this event. And dead chuffed we are too to be included in such prestigious company! We have four beers we are bringing along. Black Perle, our 3.5% coffee milk stout. A rare outing for this in keg format. Mariana Trench, our 5.1% pale ale. A best seller that hopefully you will be familiar with. Bad Habit, our and Northern Monks' 8.6% Belgian Tripel with a small twist of Cascade. 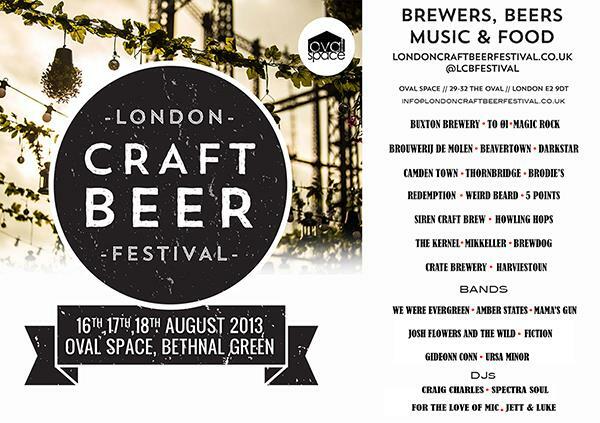 We have two pairs of tickets to one of the sessions to give away for this Festival. 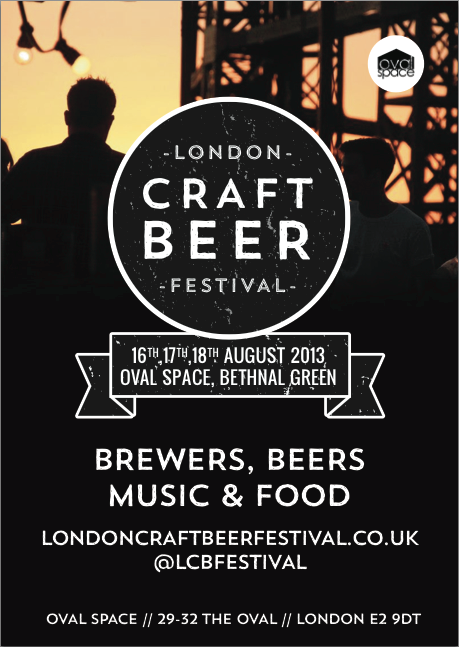 Leave a comment with your "Bad Habit" that you hope to bring (or not) to LCBF and the best two will win the tickets. (The selection will be made by the Weird Beard Collective, namely Gregg and Bryan). Deadline for comments is 1st August. Here is other key information for the festival. It's been over a month since our last general blog. 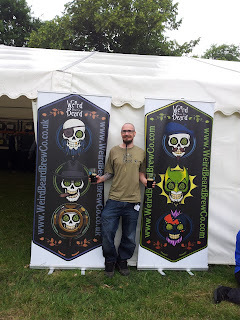 So I thought I would write a quick catchup on what has been going on in Weird Beard land. Last time I talked about our collaboration we were lucky enough to brew with our kindred home brewer spirit Andy Parker from Elusive Brewing. Well this beer was launched at an event affectionately know as #Twissup in Macclesfield on 29th June. We also got this beer out to some other bars and shops to go on sale on the night. This beer has been a huge success, but if you had tried Andy's original home brewed version, you would know it was always going to be. We have re-brewed a couple of our core beers. Mariana Trench, which is fast becoming our most popular beer, has now been brewed 3 times. Batch 3 has gone mostly into cask and Key keg, as this is the demand is at the moment. In fact casks are going so fast, 90% of this batch was pre-sold before the casks were even full. We have also re-brewed Black Perle, but with a few tweaks. We would be interested to hear peoples thoughts on this. We would actually quite like to get this beer up to 4.5%, so i think this beer will evolve over time. We also struggle to get hold of the same beans we used last time. Holy Hoppin' Hell has also been through our system again too. If you read the blog, or the label, you will know the idea behind this beer is to to keep the the same basic grain bill each time, but change up the hops. This time round we decided to celebrate the success of Mariana Trench and use the same hops, but amped up. As we grow more confident as brewers and with our equipment, we are managing to drag a lot more efficiency out of the kit, so expect something above 9%, less sweet, more bitter and far more fitting of the name this time round. Another collaboration that was mentioned in the last blog was our Belgian Triple, brewed with some strange cloaked characters from up North. Weighing in at 8. 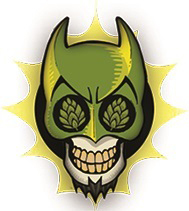 (something)%, Bad Habit, our collaboration with the fine people from Northern Monk will be launched at the Birmingham Beer Bash from 26th July. We have also been allowed out of the brewery a few times. One of our regular customers, The Rake down in London Bridge found themselves with 3 key kegs of our beers on at the same time, so invited us down for a low key meet the brewer session. They had Mariana Trench, Saison 14 and Hit the lights, and two brewers just hanging around chatting to anyone who would listen. 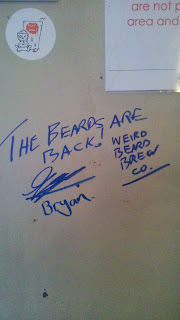 We also got to sign the way again, a little over a year after we signed it first time round when we were invited to give out samples of our prototypes at their London Beer Festival in 2012. 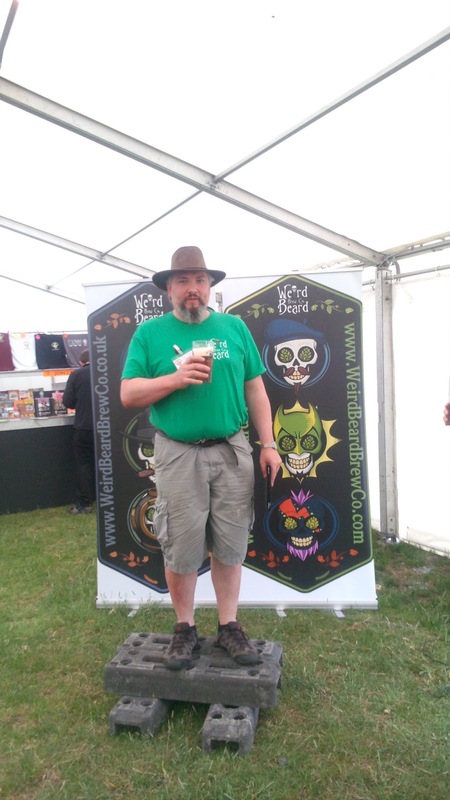 As the only local brewery to do cask in our local area, Weird Beard were invited along to open the Ealing Beer Festival over the weekend of 3rd - 6th June. We had 3 casks, Black Perle, Mariana Trench and Hit the Lights, and loads of bottles on the bottle bar. The casks were all sold out well before close of play on the first day, so we rushed back to the brewery and found the first cask of the second batch of Black Perle, which went on on Saturday, and promptly sold out again. We also delivered some extra bottles of Mariana Trench, which along with all of our other bottles were sold out before the end of the festival. The fist picture above shows our very own Gregg Irwin (Dredpengiun) standing on some fencing blocks saying a few words to officially open the festival. The second is WeirdBeardBryan, just posing. 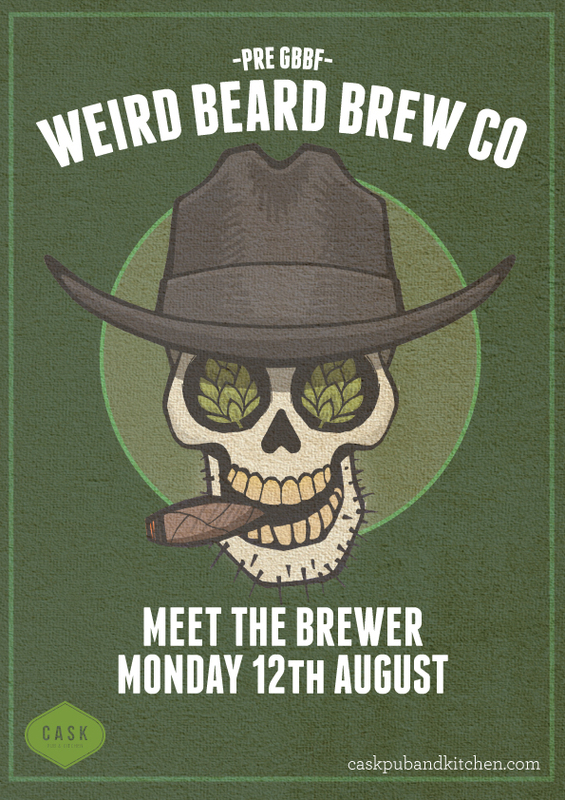 We have a few more meet the brewers and festivals lined up. 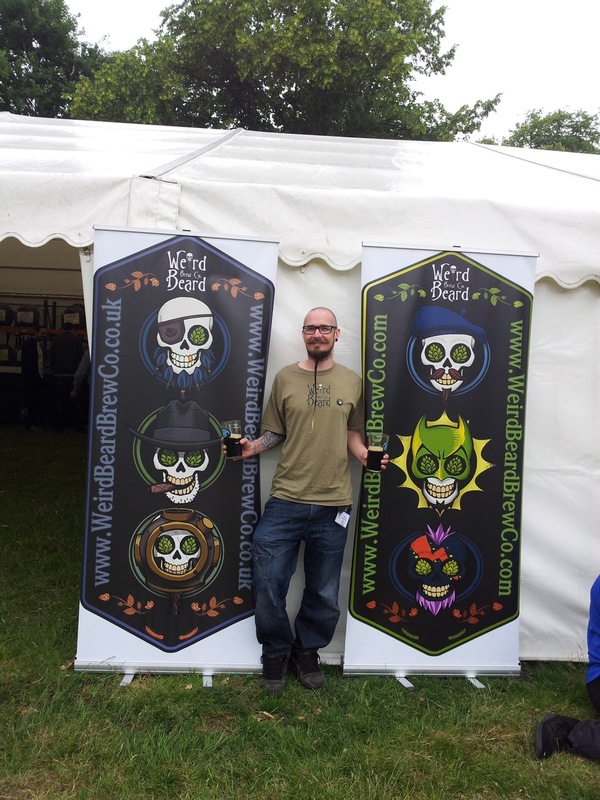 Meet the brewer at Powder Keg Diplomacy on Monday 22nd July, Birmingham Beer Bash from Friday 26th July, London Craft Beer Festival from Friday 16th August. There have also been a few other festivals around the county where our beers have appeared, but not directly through us, so we weren't able to promote them fully. These include the Edinburgh Independent Beer Festival and the Chelmsford Beer Festival. We were also most honored to have been invited to fill the yearly, pre GBBF meet the brewer spot at the Caks Pub & Kitchen in Pimlico. We plan on bringing 10 casks, some of which will be super exclusive, along with as many different key kegs we can lay our hands on. 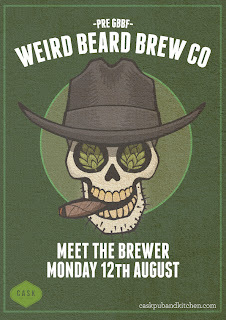 Like i say, we are so happy to have been invited along to do this, and thank the guys at Cask for thinking of us. It has not however been all plain sailing. I wrote a little last time round about our little cask conundrum. Well, we decided to up the amount of casks we produce, but this has introduced a new problem. 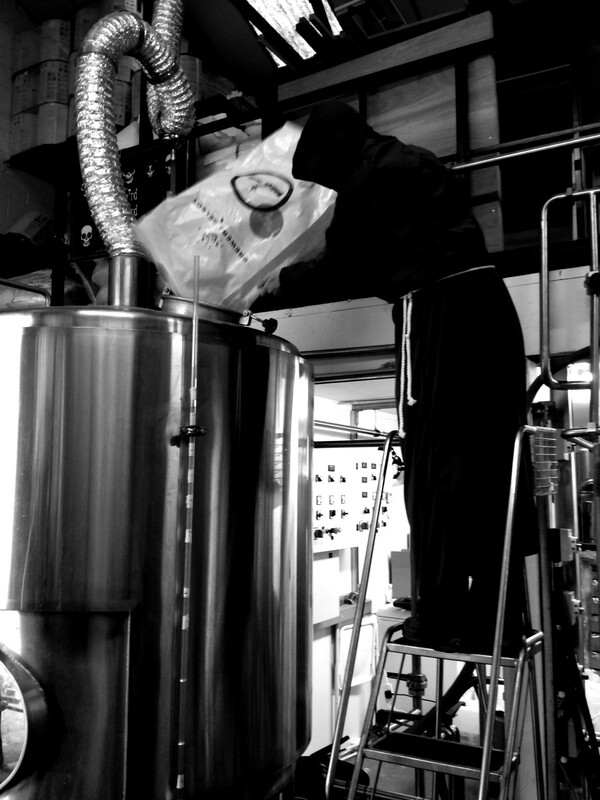 Right from the beginning we made the choice to not use isinglass to fine our beers. Basically isinglass is a substance derived from the swim bladder of fish, that is added to real ale to help pull some of the haze from the beer, as people do tend to prefer a clearer beer. We are not bothered by cloudy or hazy beer, as it tastes just as good, and sometimes better. But we have had some comments and even complaints that a few of our beers are a little on the cloudy side. One major culprit is our new, and very popular session beer Little Things That Kill. Now this beer has a LOT of hops in, and most of them are dry hops which are added to the fermenter a few days before packaging. These hops often like to hang around in the beer, giving out their fantastic hoppy flavour to the drinker. But this can be seen as cloudy bad beer to some people. We are going to experiment with non isinglass finings and see if we can improve on this a little. Another, and maybe more serious issue has been with the carbonation of some of our key kegged saisons. This has been a bit of a school boy error, and we have more than learnt from our mistakes. But we have to apologies to anyone who was affected by beer fobbing in the most part, to an exploding key keg. Basically, we wanted our saisons to have a bit more carbonation than most of our other beers, hence why they don't appear in casks. Unfortunately we over done it a little, and the key kegs had just too much gas in them. This mixed with the hot weather has made these a little difficult to deal with. We have depressurized the kegs still at the brewery, and tried to contact everyone who may still have one in their cellars, but if you are concerned, please do get in touch. We are essentially still a couple of home brewers playing on a huge scale. We are still learning. And a big part of that is learning from mistakes. 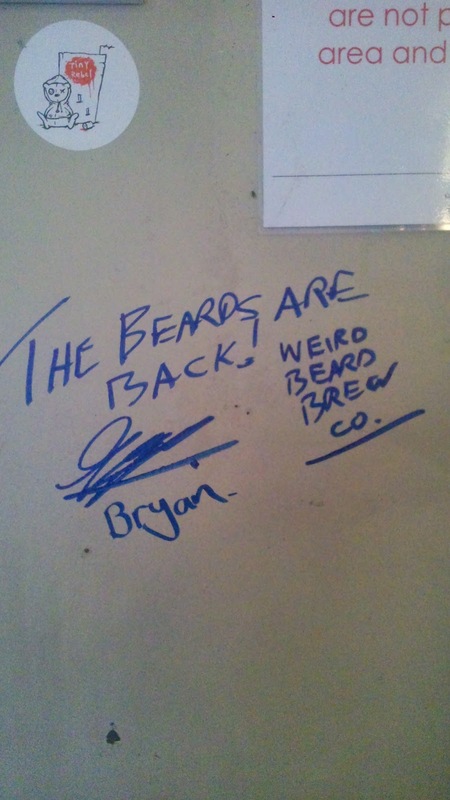 All views and grammatical errors are those of @WeirdBeardBryan, and not always the Weird Beard collective.